Cain Velasquez is the undisputed UFC heavyweight champion of the world. The new champ made quick work of the former division king, Brock Lesnar, with a first-round technical knockout at 4:12 of the opening stanza. Velasquez isn’t one to show a lot of emotion outside of the Octagon, but after the biggest moment of his fighting career, he described the feeling following the win. “It’s a great feeling, definitely, to have the belt,” said the newly crowned champion and No. 1 fighter in the MMA heavyweight rankings. For just a few seconds after he pounded Lesnar into a technical knockout, Velasquez walked away from his beaten opponent and his face changed from the typical stone cold look fans are used to. The chiseled grill of the Mexican-American heavyweight changed to one visibly overwhelmed with joy. It almost appeared as though the new heavyweight champion was on the verge of tears. Velasquez went on to explain that this was the best ending to the fight he could have imagined. Of course, every fighter hopes to have the optimum ending to their fights, but you could truly see the emotion through Velasquez’s four ounce gloves when he covered his face after the fight had been halted. The joy one can experience from becoming a world champion is sacred. Few on the planet can tell you what it feels like, which makes Cain Velasquez part of an exclusive fraternity. Like Ricco Rodriguez before him, Velasquez holds UFC hardware with Hispanic blood coursing through his veins – something the UFC marketed without reservation leading into his shot at the title. It’s a pill that a lot of fight fans are tired of swallowing, but the new champ doesn’t seem to be concerned about that controversy. As a matter of fact, Velasquez represents himself and the people of his background as Latino just as easily as the UFC wishes to promote it. With the UFC planning expansion into foreign markets, all eyes are currently on Mexico. Obviously, Velasquez is an ideal candidate to fight South of the border, but nothing has been confirmed as far as an ETA for the UFC’s Mexican debut. Before the fights in Mexico happen, Velasquez will duel with Junior dos Santos in his first title defense. UFC president Dana White has already confirmed this fight will happen, but there is no word on when the epic battle will take place. Velasquez knows that he has a tough test ahead of him in his next fight and recognizes the danger that dos Santos can bring to the table. Experts might say that dos Santos has a slight edge on the feet, but Velasquez’s power is second to none…literally. According to the Sports Science Lab, his punching power measures at 2,230-pounds of force. This statistic is higher than any boxer ever to appear on the television show. 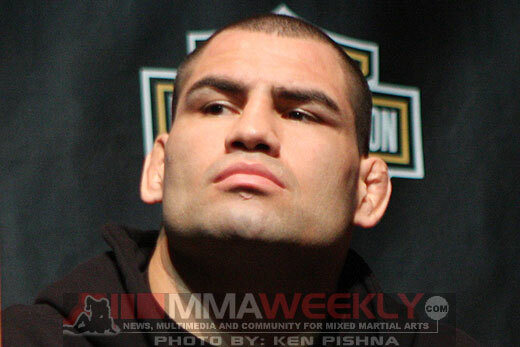 One thing can be certain – Cain Velasquez versus Junior dos Santos will pack a heavy punch for fight fans.